Born and raised in Montana. Spent most of the time there in the Western part. Now live in Arizona. Served in the U.S. Army for over 22 years. Retired as MSG/E-8. Highest award received was Defense Meritorious Service Medal. Worked in a variety of positions, mostly in communications/electronics and computers, but was also a Motor Sergeant. Click here to see more about my Army career. NASCAR - watch it every week. favorite driver is Dale Earnhardt but he's gone, so Jr, Tony, or whoever i feel is doing a good job. Just ain't the same without Dale there. NHRA - I love the sound and feeling of a top fuel car running. 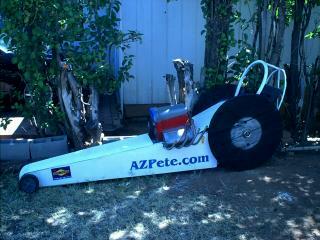 My favorite is John Force - I finally got to see him live in Tucson Jan 2002, also like Tony Schumaker and WJ. Also watch Grand Am, ALMS, WRC, Dakar, etc. Baseball - Have a local team, finally, Arizona Diamondbacks Congrats to them for the NL West Championship in 2007. Computers - love to try all sorts of combinations to get better performance out of them and build pc's out of parts I find laying around.